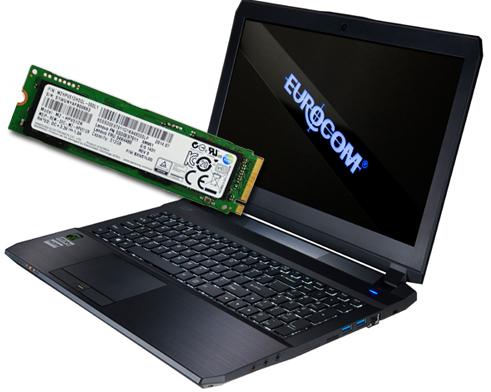 Eurocom is shipping the 512 GB Samsung SM951 M.2 PCIe SSD in the 15.6” M5 Pro high performance, upgradeable laptop with NVIDIA GeForce GTX 980M graphics, Intel Core i7 processors, a beautiful 4k display, 32 GB memory, all in a beautiful 1 inch thick brushed aluminum chassis. The Samsung SM951 M.2 PCIe SSD is the perfect storage solution for new Eurocom laptops with the M.2 storage interface for extremely fast and space efficient storage options. Samsung’s SM951 comes in the M.2 form factor (80 mm x 22 mm), it weighs approximately six grams. The drive’s compactness is well suited for new Eurocom slim design laptops, which is a steep contrast to the epic performance it wields. Improving battery life of the EUROCOM M5 Pro, the Samsung SM951 is the first SSD to adopt the L1.2 low power standby mode, allowing the SM951’s power consumption to be drastically reduced – to under 2mW, about a 97 percent decrease from the 50mW consumed using a L1 state. The EUROCOM M5 Pro supports a beautiful 15.6-inch 4K 3840-by-2160 display as well as a FHD 1920-by-1080 matte display. The high pixel density of the 4K display with 8,294,400 pixels provides extremely detailed images for true to life content. Eurocom also offers professional colour calibration services to ensure every one of those 8 million pixels are accurate as possible. To power this multitude of pixels the the EUROCOM M5 pro supports both NVIDIA GeForce GTX 980M (4GB DDR5) or GTX 970M (3GB DDR5) graphics for unbeatable performance, raw power and great battery life.